I grew up in North West Victoria, a Mallee girl born and bred. My primary schooling was at the local State school so I had nothing to do with nuns at all. For my secondary education, I went down to Melbourne where I met the Sisters of Charity. I went to St John’s, Clifton Hill, and then on to Catholic Ladies College, East Melbourne, where I became very involved with the Young Catholic Students movement at school and I was a member of the Junior Legion of Mary in our local Parish. On weekends, as Junior Legionaries, we visited Caritas Christi Hospice, Kew, where we helped to feed the patients, or, sometimes, we travelled to the Little Sisters of the Poor at Northcote. It was there I learned to use an electric polisher because one of our tasks was to polish the floors of the general wards. After leaving school, I did my primary teacher training at Mercy Teachers College, Ascot Vale. Having been grounded at school in what was known as the Cardjin method of See, Judge, Act, I joined the Parish National Catholic Girls Movement group and found myself on the Archdiocesan Committee for the NCGM and a member of the team whose mission it was to “Put Christ Back into Christmas.” It was a great experience and, as a group, the NCGM and the YCW achieved our goal and, in the City of Melbourne in 1957, Christ was put back into Christmas. Bourke Street came alive with the story of the Nativity instead of Rudolph and Santa’s Elves. It was during this time at Mercy Teachers College and my involvement in Catholic Action (as it was called in those days) that the niggling voice in my head to follow Christ more closely became more persistent, so I decided that I would apply to join the Sisters of Charity. It was not exactly the standard reaction expected from a good Catholic family. It was a combination of shock, disbelief, horror, anger, and bitter disappointment. My family was determined to prevent me from throwing everything away and becoming a nun! They saw it as a waste of a life to be “locked up in a convent, never to be allowed home again.” With the exception of one member of my family, the rest placed every possible obstacle in my path right up until the moment I left home to travel to Sydney to enter. They were convinced that I would be back home within three weeks. 3. What was the process like in 1957 of joining the Sisters of Charity? Very different from what it is now. In those days, it was rather like applying to go to an elite boarding school! 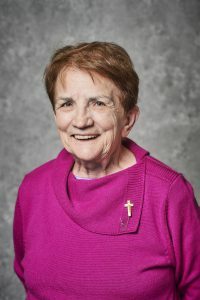 My first point of contact was Sister Marie Joan Gough who had taught me at CLC. After speaking with Sr Marie Joan, I wrote to Mother M. St Agnes Skewes, the Superior General, requesting her permission to enter the Congregation. In her reply, Mother M St Agnes asked me to meet with Mother M. St Margaret Donovan who would be visiting Melbourne in a couple of weeks. I took a friend with me for support when I fronted up to meet with Mother M. St Margaret, as memories of her when I was at school loomed large. A couple of weeks later in the mail came the lists of essential items needed to enter the Sister of Charity – Doctor’s Certificate, Reference from the Parish Priest, Birth Certificate, Baptism Certificate, Book List, Clothing List (which was very detailed and the cause of much merriment among my friends), plus 200 pounds to cover six months board (the Postulancy). On February 2, 1958, eleven entered, eleven were professed and ten made Final Vows. After Vatican II, we lost four from our group. Two have died – Patricia Lynch and Aileen Thomas. At present there are four of us left. Having trained as a Primary School Teacher before I entered, my future ministry in the Sisters of Charity was already decided for me. I did not have to make that decision. We entered on the cusp of Vatican II. Religious life for women was highly regimented. There was no room for individuality or even individual thought. Perfection revolved around one’s ability to observe the Rules and Customs without question: The emphasis was on the letter of the Law rather than the spirit of the Rule. We took four Vows; however in our Novitiate the major emphasises were on Poverty and Obedience, Service of the Poor was taken for granted and Chastity was given the briefest of mentions: ”If you have any problems, Sisters, ask Father.” Our Ministries were clearly delineated – teaching, nursing, social work. There were plenty of labourers in the vineyard. When we were professed in 1960, there were sightly more than 600 professed Sisters in the Congregation and 67 in the Novitiate. Mary Aikenhead was a picture on the wall. However, every morning the Breakfast Reading did include a quote from her letters. Apart from the Centenary of her death in 1958, there were no Congregational celebrations specifically in her honour. contemplatives in action impelled by the love of Christ. going out to the margins, walking in partnership with others. As apostolic women Religious, we are the heartbeat of the Church and we are there “to prick the conscience of the king.” Women Religious are no longer the foot soldiers or camp followers in the Church Militant of pre-Vatican 2. We are essential to the life and mission of the Church. We are Christ’s gift to his Church. These times are the most challenging times for me. The old concepts of religious life are being turned upside down, inside out. We are in the process of creating new wine skins for new wine and it is not easy: We are still caught up in the on-going process of creating community from diversity, celebrating differences as together we strive towards the common good, and, as courageous as that sounds, it is fraught with obstacles and pitfalls, the least of which are the loneliness and the isolation experienced by those who see hope being whittled away. Religious life as I knew and experienced it, is now in the process of being immersed in a completely new role and direction. Our hospitals and schools, where the majority of us ministered and gave tangible expression to our vow of Service to the Poor, are no longer under our control – they are under the canonical stewardship of the Trustees of the Ministries of Mary Aikenhead. Many Sisters of Charity, including myself, are grappling with the fact that although eventually our charism to share the love, tenderness, and concern of Christ with all whom we meet, seeing Christ in everyone, which underpinned everything we did and still do, will be replaced with a new charism formulated by the Trustees of Mary Aikenhead Ministries, incorporating the ideals and values of Mary Aikenhead. Our hope and prayer are that it will be more than a regular Mission Statement. My struggle is to realise and appreciate that our ministries were never ours, they are the expression of the Church’s mission to us, as Sisters of Charity, to be extensively useful in the service of the poor. Being the type of person that I am, I have been able to immerse myself in whatever ministry I was appointed to and whatever task I was given. Each brought its own reward and sense of fulfillment even in the darkest times. The highlight of my years as a Sister of Charity was being among 16 Sisters who went to Ireland for the 200 Years Celebration of the Founding of the Religious Sisters of Charity. It was the most amazing experience to see the places where Mary Aikenhead lived and worked and to walk in her footsteps. Sr Colleen Jackson and I were lucky enough to stay in Donnybrook Castle which was purchased by Mary Aikenhead in 1837 and was the place where Alicia Baptist de Lacy spent the last years of her life instructing the Magdalens who worked in the huge Laundry that was once a part of this complex. Stunned surprise. They don’t expect a jeans and t-shirt, two German Shepherds in tow, person to be a Sister. It doesn’t fit the image. It is salutary to know that Mary Aikenhead had a small black dog called Dandy which she described as being of “questionable parentage.” Dandy accompanied her everywhere – Board Meetings, interviews of prospective Postulants, Exhortation, Chapel -and slept in a basket beside her bed. Unlike Mary Aikenhead’s Dandy, my pair have impeccable pedigrees. Karl Rahner described death as “being turned inside out in order to experience new life.” We are in the death throes of the old form of Apostolic Religious life that has served us well since December 9, 1816. Our mission to be extensively useful in serving the poor as Religious Sisters of Charity was given to us by the Church in the early 19th Century. We were the first Congregation given the title of Apostolic Women Religious by the Vatican. A new way of being Apostolic Women Religious in Australia is coming to life. It is breaking from the bud. We are surrounded by possibilities of sharing the love, tenderness and concern of Christ with all whom we meet, seeing Christ in everyone. The Sisters of Charity of Australia, from the moment those five women set foot on Australian soil December 31, 1838 have been flexible, able to read the signs of the time and to face challenges head-on. We are continuing to do this. One has only to look around and see the variety of ways our Sisters are sharing their gifts with the most vulnerable in today’s society as they continue to move out to the margins, working in collaboration with others. Apostolic Women Religious in Australia are embracing change and continuing “to prick the conscience of the king” both in the Vatican and in Canberra. We are continuing to strive together with those people who are part of our journey, to bring about the “inbreaking of the Reign of God.” A new form of Apostolic Religious life is evolving, one that is interwoven with vowed Religious and vibrant strands of committed and dedicated laity who are impelled by the love of Christ.